Salmon spend much of their life at sea but return to fast flowing, healthy rivers like the Annan to breed. They move upstream November to February when the river is in full spate. 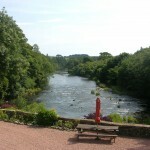 Riverside Mill has course fishing available along our stretch of the river. Whilst Salmon and Sea Trout may be viewed they cannot be fished. Salmon and Sea Trout Fishing can be arranged locally. We now have a high definition web cam in our grounds providing live conditions for the River Annan. Red Squirrels are regular visitors to the grounds of Riverside Mill B&B. Purpose built dog kennel with run, or can be left safely in the car.